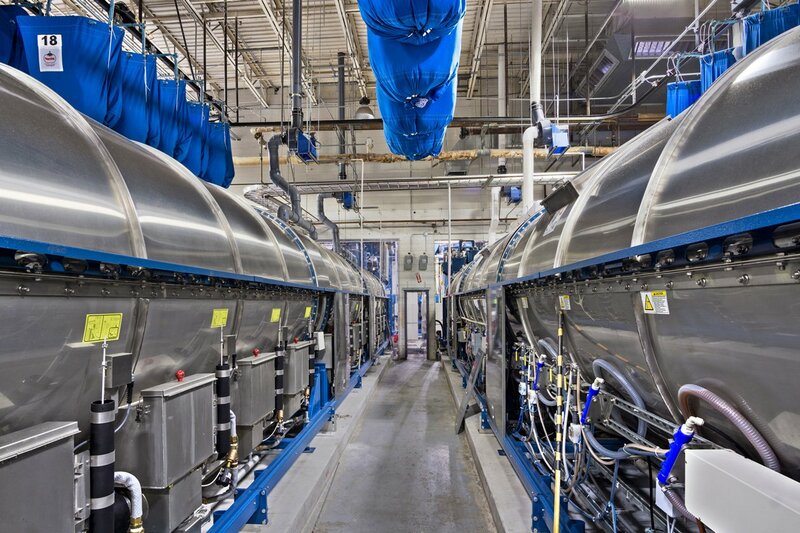 ARCO/Murray recently completed a 74,000 square-foot healthcare laundry renovation for Bay Linen in Clearwater, Florida. The project scope included a complete renovation of the washroom, boiler room, cart wash and sterilization area. It also included the addition of new finishing equipment and a new soil sort system. The existing washroom equipment was replaced with three new systems including 12-mod tunnel washers, presses and batch dryers. Replacement of the existing equipment was performed in three distinct phases. Each phase consisted of shutting down an operating tunnel line, removing the equipment, replacing it with a new tunnel, press and dryers, and bringing the new system on-line before moving to the next tunnel. With this approach, Bay Linen was able to stay fully operational during the project. Steiner Atlantic Corporation provided the equipment package including Milnor, Chicago Dryer and Cleaver Brooks equipment. ARCO/Murray provided a complete design/build solution including design, permitting, building modifications, process utility work and final equipment connections. ARCO/Murray’s Nick Behm served as project manager with Alan Thompson as project superintendent.